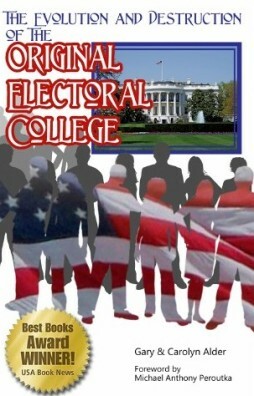 Now let us review the biggest differences between the Electoral College System as it was intended under the original design of the Constitution compared to how the popular vote system functions today. While we preface our description of the current version with the word now, the tactics being used go back in many cases to the time of the 12th Amendment and before. The purpose of the Electors was to nominate well-qualified possible presidential candidates. In fact the system was designed to provide the best potential candidates. The Electors were to start the candidate selection process by each nominating two outstanding individuals. The Electors perform only a rote mechanical process—weeks after the President has “won” the election. There is no need for real people to be involved. This is just a statistical derivative. The tabulation of the nominations created a field of candidates. Normally the field would consist of five candidates—those with the highest number of nominating electoral votes. The final choice in this situation would have been made by the House of Representatives. Each state would have one vote—regardless of the number of Representatives from that state. To elect a President, a majority of the states needed to concur. The counting of the electoral votes is totally ritualistic. Nothing new is revealed to anyone. The outcome of the election is already known. Both the nomination and candidate selection functions are now performed by the political parties and are usually accompanied with arguing, wrangling, and political maneuvering. The President and Vice-President would both come from the same pool of up to five candidates formed from counting the electoral votes. The Electors, acting independently, were not to have any control over which candidate might become President. They were to submit the names of the best nominees they could find. The presidential candidates from each party select a “running mate” who will garner votes for the team. The criteria for selection is often that the vice-presidential candidate can obtain votes from a different geographic area and political position, such as bring more liberals, moderates, or conservatives to vote for the team. The individual selected as the vice-presidential candidate is sometimes one of the same candidates that the presidential candidate spoke so disparagingly about in the party campaigning process. The system was designed as a win-win selection of the best candidates possible. The Electors were to nominate eminent statesmen rather than popular party politicians. Even before the acclaimed “grassroots” citizens get involved, supporters of each candidate build party machines to elect their candidate and disparage all other contenders in their own party. After securing their party’s endorsement, they then unite in a greater hatred—the opposing party. All their efforts are focused on defeating the other party’s candidate. Electability becomes more important than principles or the capability of the candidates. The system was designed to elect the President without campaigning and demagoguery. Candidates would be selected on the basis of the value or service they had previously provided to their state or to the nation—past performance rather than campaign promises. The system is all about campaigning and campaign funding—spending billions of dollars and campaigning for years. This leads to the campaign promises that very closely resemble bribery and usually imply a more than constitutional presidential involvement in the legislative process. In other words, the executive campaigns on his agenda and ability to pass certain legislation. Legislation is not a constitutional presidential prerogative. This campaigning encourages paternalism and central government solutions to local problems. The election of members of the U.S. House of Representatives and the appointment of U.S. Senators by the states were separate from the appointment of Electors. The states originally set the time to appoint Senators and elect Representatives; therefore there were no coat-tail elections. The whole election process is party oriented and party controlled. It was entirely up to each state legislature how qualified presidential Electors were to be appointed. The Constitution has not been changed in that regard. The Constitution specified several protections to prevent Electors from being unduly pressured or influenced to choose certain individuals. The state legislatures have turned this responsibility over to the political parties. Each Elector must be committed to his party and specifically to the party’s presidential candidate before he can be an Elector. In practice the political parties select the Electors either by party leadership or in party conventions. Each party submits the names of their Electors to the state. The party winning the presidential vote in the state supplies its Electors for a pre-committed outcome. The Electors for a state could have a split vote. Considering the fact that two names were required from each Elector, it was always a split vote prior to the 12th Amendment. With all Electors doing their own thinking, it was possible for each state to nominate many potential candidates. Except in Maine and Nebraska, all electoral votes are awarded to the president/vice-president team that receives the most popular votes in the state. This is known as the winner-take-all system. In Maine and Nebraska each congressional district has one electoral vote awarded to the slate of candidates with the most popular votes in that district. The remaining two electoral votes go to the winner of the state-wide popular vote. The presidential candidates could not even be determined until the certified lists from the Electoral College meetings were opened by the President of the Senate and the votes were tallied. The Vice-President was selected from the same pool of candidates and could only be determined after the President was chosen. The news media broadcasts every few minutes how many electoral votes each president/vice-president team has captured, even before the voting in a state is complete. Hours before the polls close in the western states, the election results are announced by the media. The actual meeting to open and officially tally the electoral votes is only a formality. The whole world already knows the outcome—and has since election day. The structure of the United States government was a complex representative republic. One of the distinguishing features was indirect election of some positions to represent different interests. This was effectively exhibited by the indirect method of selecting Presidents. After the destruction of the original Electoral College System it has become largely a representative democracy, (popular vote system) subject to the demagoguery and deceit that goes along with rabble rousing.